With a certain panache and not a little bit of a swagger, Cubicle Seven Entertainment’s celebration of Doctor Who’s fiftieth anniversary leaps into action and full colour with The Third Doctor Sourcebook for Ennie-award winning Doctor Who: Adventures in Time and Space roleplaying game. Having begun with The First Doctor Sourcebook and continued with The Second Doctor Sourcebook, the third entry in the series takes into the seventies to detail the full colour adventures of the Third Doctor as played by Jon Pertwee. With arrival of the Third Doctor in the story, Spearhead from Space, the series underwent a radical series of changes whilst still looking back to the previous decade. Two of the Second Doctor’s adventures pre-figure the era of the Third Doctor. The first is Web of Fear, the story that marked Second Doctor’s encounter with the Yeti and the Great Intelligence in the London Underground along with his first with Colonel Alistair Lethbridge-Stewart, which would lead to the establishment of UNIT—United Nations Intelligence Taskforce—to which the Third Doctor would find himself attached to as Scientific Advisor under the command of Brigadier Alistair Lethbridge-Stewart. The second is his last adventure, The War Games, in which the Time Lords exile the Doctor to Earth, meaning that he would no longer be able to travel in time or space and that his adventures would initially be confined to Earth. Of course, this would change in later series. In game terms, what this means is that two of Cubicle Seven Entertainment’s previous sourcebooks serve as companion volumes to The Third Doctor Sourcebook. The obvious and more essential one is Defending the Earth: The UNIT Sourcebook as it defines the organisation that the Doctor will be working for, whilst the The Time Traveller’s Companion is of use once the Time Lords begin to manipulate and use the Third Doctor. Another way in which the Third Doctor looks back to the previous decade is how his adventures model those of the classic ITC adventure serials such as The Persuaders!, The Protectors, Department S, and so on. For the Third Doctor, a much younger incarnation of the Doctor, is a man—or Time Lord—of action. Unlike his forbears, the Third Doctor is prepared to fight for what he believes in, though usually only using his Venusian Aikido, and he gets involved in a vehicle chases in Bessie (his souped up vintage speedster), the Who Mobile, helicopters, hovercraft, and so on, lots and lots of times. Although the Third Doctor introduced ‘aliens’ that would return in later incarnations—in particular the Silurians, the Sea Devils, and the Nestene Consciousness and the Autons, his stories also introduced a major new villain, one that would plague each of his subsequent incarnations. The Master, a fellow Time Lord, would work plans within plans, ally himself with the Daleks, all to rule the Earth or destroy it, rule the universe or humanity, or simply humiliate the Doctor. He wanted power, and even though he would be captured again and again, he would escape each time to continue his machinations. In some ways, the Master is the nearest that the Third Doctor comes to encountering true evil—barring the Daleks of course! The Third Doctor Sourcebook takes us from the Third Doctor’s arrival on Earth and his first foiling of an invasion of the Earth whilst working for UNIT in The Spearhead from Space to his final encounter with an invasion attempt in The Planet of the Spiders, an encounter which would lead to his regeneration. Barring The Time Warrior, the Third Doctor’s adventures do not take place in the past. The majority deal with the themes of big authority and scientific hubris, of peace versus war, and of mysteries without real villains. For the most part, The Third Doctor Sourcebook presents an opportunity for the Doctor—or indeed, the player character Time Lord and his Companions to not be so much wanderers in the Fourth Dimension, as protectors of Earth and humanity, to form a family with UNIT, but still be a force for good and for truth. The book is essentially broken into two parts. The first introduces us to Pertwee’s portrayal and explores his character, his Companions, the difficulties of his travels during this period—mostly the fact that he cannot travel, and the common themes and ideas. In particular that the Third Doctor’s character is rather patrician in nature and he only has the three Companions over the course of his adventures, though he is sometimes joined by members of UNIT. His adventures deal with the dangers of technological progress, diplomacy and attempts to bring about peace—both world and galactic, environmental concerns, and the possibility that a Companion might fall in love whilst travelling with the Doctor or even betray the Doctor. As well as the stats and write-up for the Third Doctor himself, The Third Doctor Sourcebook includes stats and write-ups for all of his companions. The most notable changes in the Doctor are the addition of his ‘Hotshot’ Trait, to represent how good he is behind the wheel of any vehicle, and his ‘Reverse the Polarity of the Neutron Flow’ Trait which gives him an instinctive understanding of energy fields. Most of the new Traits come from Defending the Earth: The UNIT Sourcebook and The Time Traveller’s Companion. There are also write-ups of the Third Doctor’s notable foes—the Master, the Nestene Consciousness, and the Daleks. Rounding out this half of the book is an excellent discussion about the Third Doctor’s themes and the creation of adventures suited to his era. As with every entry in the series, the second and longest part of The Third Doctor Sourcebook is further divided into chapters that travel chronologically in order through the Third Doctor’s adventures. For each of these there is a synopsis followed by a guide to running the adventure and a listing of any appropriate characters, aliens, and gadgets. The guide to running each adventure is not a straightforward adaptation, but rather a discussion of themes and ideas inherent to the adventure. So for example, in the discussion of The Claws of Axos, it is suggested that whenever the Doctor instructs Jo to stay where she is whilst he goes off to do something, as soon as he leaves, she should go exploring! Why? Well, because it is interesting and it pushes the story forward. Rounding the entry for each story is a selection of Further Adventures, hooks that could be run as possible sequels. Physically, The Third Doctor Sourcebook is a slim hard back book, suitably illustrated throughout with photographs—now in colour! The volume feels solidly researched and well written, but if there is a downside to the book, it is that not going to appeal or be of use to everyone, and that is going to be an issue with each of the subsequent volumes in the series. After all, almost everyone has their favourite Doctor and also their least favourite Doctor, and that may be reflected in the Doctor Sourcebooks that they purchase. 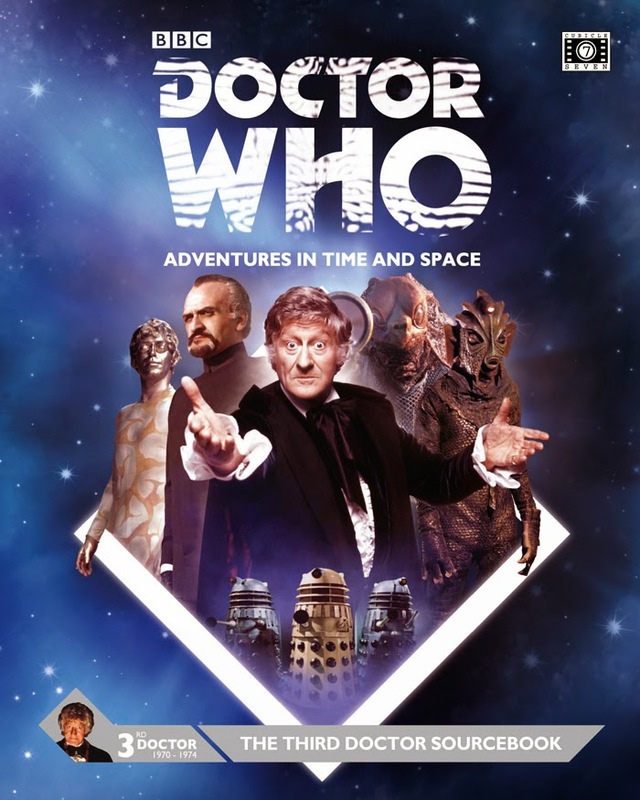 With The Third Doctor Sourcebook, the adventures presented here are even more dynamic, even more knowing, and even more exciting than those of The First Doctor Sourcebook and The Second Doctor Sourcebook. Yet in comparison with The Second Doctor Sourcebook, there is perhaps less depth to the writing in The Third Doctor Sourcebook, but that is likely down to how straightforward the stories are for the Third Doctor. The Third Doctor is the first generation to have all of his adventures available to purchase and watch on DVD, but apart from the later stories when he manages to leave Earth, they will feel unfamiliar in terms of style and oddly constrained. That comes down to the Third Doctor’s exile on Earth, and anyway, they lend themselves to a very different style of campaign, one which The Third Doctor Sourcebook should make you feel very at home with (even if that home is Earth! ).